It is often argued that wide disparities of income are needed to encourage the most talented to be more productive and accept jobs that are more challenging. We have accepted that some income inequality can be beneficial to society if it actually provides an incentive for greater productivity. However it must be recognized that human motivation is complex — there are many reasons why humans choose to be productive, only one of which is income. This diminishes the need to rely on income incentives alone to raise productivity. For that reason in this section we will digress to explore non-income related aspects of productivity. A good question: Why do people not create or work? Rather than, Why do they create? Everyone has the motivation to create and to work, every child, every adult. This can be assumed. What has to be explained are the inhibitions, the blocks, etc. What stops these motivations which are in everyone (Maslow 1965, 8)? These highly evolved individuals assimilate their work into the identity, into the self, i.e., work actually becomes part of the self, part of the individual’s definition of himself. Work can be psychotherapeutic, psychogogic ( making well people grow toward self-actualization). This of course is a circular relationship to some extent, i.e., given fairly o.k. people to begin with, in a fairly good organization, then work tends to improve the people. This tends to improve the industry, which in turn tends to improve the people involved, and so it goes. This is the simplest way of saying that proper management of the work lives of human beings, of the way in which they earn their living, can improve them and improve the world and in this sense be a utopian or revolutionary technique (Maslow 1965, 1). In the textbooks I’ve seen, this is based almost entirely on an obsolete motivation theory of lower basic needs exclusively (leaving out higher needs and metaneeds); furthermore it assumes that these can be phrased in interchangeable terms, which in turn implies that any accounting deals entirely with objects or qualities or characteristics that can be phrased in terms of money and therefore put into a money accounting balance sheet (205). This is expanded from a model developed by Leibenstein (1975) to include humanistic factors adapted from Maslow’s theory of motivation. In keeping with economic convention, U here stands for an individual’s utility. E is the amount of directed work effort. P*, standing for personality, is starred to distinguish it from the similar factor offered in Leibenstein’s model based on id and superego (constraint concern). To this Tomer adds individual drive and maturity or psychic health. Here Tomer cites Maslow that a healthy individual is self-actualizing, and therefore more self-motivated and less dependent on external motivators. DO stands for the demands of the organization, along with its accompanying pressure. The element WE, or work environment, can also be broken down into distinct, though interacting elements. First, there must be a match between the individual and the job or organization. A person can be more or less suited for the nature of a job (ie., whether it involves social interaction or is solitary, literary or mechanical skills, etc.) or to the management style of an organization (competitive, or cooperative and consensus-oriented). Second is the structure and supervision of a job. Third, both the organization and particular jobs require meaningful goals. Finally, there are implicit contracts, a term coined by Arthur Okun to denote unwritten standards of fairness which govern employer-employee relations. FG represents future growth, the potential perceived by the employee to grow and learn in the present job. Presumably, such potential will increase self-esteem, enhancing job satisfaction and bring motivation for a higher level of performance. This is an improvement over Leibenstein’s model, U = F(E, P, DO), which implies that the only way to improve productivity is to increase pressure from the boss. Tomer points out that his model shows a trade-off is present from this pressure. Short-term productivity may rise, but at the cost of long-term productivity, as employee satisfaction erodes. Further, Tomer’s model emphasizes that long-term motivation, resulting in higher productivity, comes from a high-quality, humanistic work environment. Development of such an environment requires investment in what Tomer has coined organizational capital. Here I present a model that is similar, yet has important differences. I forgo the economic convention of using “U” for “utility, replacing it with “Pr” for productivity. We are not measuring individual utility which results in productivity, but will look at productivity directly. (Tomer’s model seeks to identify those factors which affect an individual’s utility to expend effort on a job.) It was judged that there are causal factors important to creating ultimate productivity, such as talent, but are not related to any conscious or even unconscious utility calculation. Let us look closely at the model that will be developed through the rest of this paper. “A” stands for individual ability. I will assume that there are innate differences in abilities and talents that affect one’s productive capacities. The designation of P for personality is accepted here as in the previously cited models. Tomer’s expansion of the personality concept to include psychic health according to Maslovian self-actualizing criteria is also accepted here — self-actualizing people are likely to be more productive. Work ethic should also be considered as a personality trait, related to psychic health, yet distinct. Acknowledging the contribution of the human capital theory in labor economics, education (Ed) is included in the model. Even critics of this theory must acknowledge that formal training has at least some relation to the productivity, and consequently the value, of an employee. However the importance of experience (Ex) is also acknowledged, as is emphasized in the competing Institutionalist school (Osberg 1984). Also accepted here is Tomer’s inclusion of WE for work environment. A new element introduced in this model is SC, for service culture. This refers to the degree to which service and self-sacrifice are encouraged in the culture. Assuming the organizational objective is worthwhile, a person more enculturated in a service ethic would be more motivated to expend effort toward that objective in his or her organizational role, without expectation of personal reward. Finally comes the element of MI, or material incentive. As can be seen, this is only one of several factors involved in achieving productivity, and should not be overemphasized. However, it is this factor which must be viewed separately in our discussion of optimal income inequality. All of the variables can be assumed to interact. For example, those with greater ability are likely to pursue more education, and more education may enhance abilities. Experience will reinforce the effects of education as well as enhance ability, while both ability and education will open doors to gain experience. The quality and organization of the work environment can also reinforce or detract from the effects of the other variables, as does the quantity and nature of compensation. In the following section we will be most concerned here with the effect of MI in the equation above, or in mathematical terms, MI/ Pr. The other factors are held constant, but are assumed to be established at very high or optimal levels. We are assuming a progressive society where a quality work environment, high educational standard, etc. are demanded, and as a result productivity is raised all the more. Now that we have discussed some of the elements of human productivity we can proceed to our next logical jump. We have examined the nature of material incentives, and found them to be only one of a number of factors which contribute to productivity. However we accept that material incentive can make a difference in individual productivity, a difference that varies from person to person. Our next step is to use this understanding to create a model for finding the theoretically optimal level of inequality. The logical bridge to be used here will be the introduction of a new idea which is both a value judgment and a statement of reason: that the only justification for any level of income inequality in society is the incentive that is provided which spurs greater human effort, benefitting society. The economics discipline has long struggled with questions of how to achieve the most efficient output and distribution, as well as the most equitable. But efficiency and equity have generally been regarded as matters that need to be considered separately. Indeed some have insisted that questions of equity are not even proper to be considered by economists; such normative matters are the jurisdiction of moral philosophy and politics. The eminent welfare economist Tibor Scitovsky (1972) wrote, “Equity is a matter of conscience, not economics. In his classic work The Economics of Welfare the British economist A. C. Pigou employed the law of diminishing marginal utility to argue that redistribution of income in favor of the poor would maximize economic welfare for society as a whole. Economists were left with a conflict between maximizing social well-being and maximizing the output needed by society: an impasse between efficiency and equity. Prout provides the theoretical means to break the impasse: atiriktum. Here atiriktum may be defined as amenities above and beyond the minimum necessities of life provided to the meritorious in proportion to their merit. In short, it is the incentive that society provides to induce individuals to provide beneficial service to society. The doctrine of atiriktum solves the age-old conflict between efficiency and equity by producing exactly the amount of inequality in society that is both just and efficient. Most people would agree that perfect equality is not a just distribution — those who work harder or have invested in acquiring higher-level skills that make them more productive deserve a greater return for their work. But a degree of inequality has an instrumental purpose as well. It provides the incentive for greater efforts that serve society, and for individuals in society to conduct their business efficiently. They are confident that if they work hard and well, they will be rewarded appropriately. So a certain degree of inequality is both just for the individual and serves society well — it is efficient. The question then arises: how much inequality is needed to provide optimal economic efficiency? How much is too much? The answer is that inequality becomes excessive when its cost to society exceeds the value of the increased productivity that results from its incentive. In other words, inequality is only justified as an incentive — any material benefits (or non-material benefits, such as power) that are provided an individual beyond what would make that person perform at the peak of his or her ability represents a waste to society. Let us use some standard concepts and tools of economics to clarify this important point. A central principle of economics is the law of diminishing marginal returns. The principle can certainly be applied to atiriktum: there must be diminishing marginal returns to incentive. This fact will allow us to determine an optimal level of inequality in society. 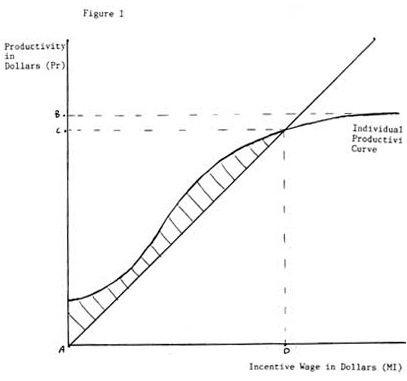 Figure I [below] shows an S-shaped curve shaped similar to those seen in all microeconomic texts, demonstrating varible rates of return from the increase of a certain factor of production. Here the changing productivity of a hypothetical individual is plotted as more material incentive is provided. The curve begins, or crosses the horizontal axis, at minimum wage. (This figure assumes a Proutist economic framework in which the minimum wage is set at a level that allows the minimum necessities of life to be purchased. Therefore, all wages shown in the diagram represent incentive to achieve beyond the minimal level required to retain employment.) Productivity is assumed to increase sharply at first, then levels off. At the peak of the curve the productivity of the individual has reached its highest potential; he cannot possibly do more. No amount of additional incentive will further raise productivity. In fact, further incentive in the form of salary may actually decrease total productivity, as an “income effect” sets in, and the individual decides he can afford more leisure. At this peak (point B on the verticle axis) the marginal product of material incentive is zero. If the sole justification for this individual to receive a higher salary than another is to provide an incentive to greater productivity, there is no reason for society to provide a salary higher than point B. Any salary beyond point B is nothing more than a windfall for the individual (economic rent in economist’s jargon) and a waste, or inefficiency, on the part of society. The advantages to society are many when productivity is so optimized by the proper use of atiriktum. Recall that atiriktum is the part of a worker’s wage that is excess over the amount needed to comfortably purchase the minimum necessities of life. So with atiriktum the worker’s basic needs are met (certainly a fundamental function of any economy), and the worker’s amenities are provided for at a level that is fair and appropriate from the standpoint of society. Moreover, she is fulfilled because society shows that it values and recognizes her unique contribution. Society benefits from her productivity, which is maintained at a high level. She produces a surplus for society, which may be used to raise the minimum wage, provide public goods, or to provide atiriktum to those such as artists, whose skills are valued by society, but not in a way that is clearly reflected in the marketplace. This surplus would also subsidize the minimum wage of those the value of whose work would not be sufficient to equal the minimum wage due to handicaps or other reasons. The question may arise, if AD is the optimal amount paid from the standpoint of society, why is it that in a market economy some may receive salaries vastly greater than this amount? The answer is complex, involving social and institutional factors as well as economic ones. Let us first look at the economic aspects of the question. Market economies are run not on principles necessarily designed to maximize and harmonize individual and social well-being (not only physically, but also on a psychic and spiritual level), but run on the principles of profit maximization, and supply and demand. Indeed, sometimes the Invisible Hand told of by Adam Smith will see that the interests of society are best served when individuals see to their own self interest, but few of even the most traditional economists are naive enough to believe this necessarily happens. Both employers and employees want to maximize their earnings, the employer by paying less, the employee by demanding more. 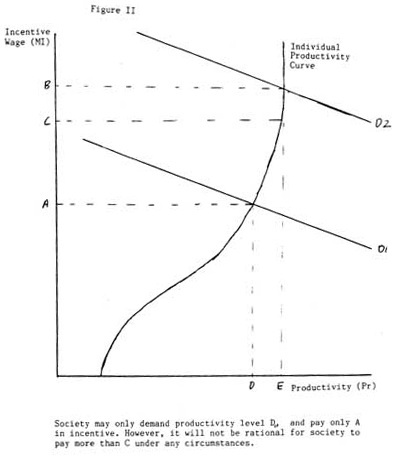 The demand curve D1 crosses the supply curve where increases in productivity are still possible. In this case the demand curve serves a useful social function by determining the level of productivity desired by society, as determined by its willingness to pay. However, demand curve D2 meets the supply curve at a wage level far beyond what would induce any further productivity. Segment BC shows a portion of the wage paid that represents a waste on the part of society. Economic efficiency requires that this amount be used by society to increase productivity elsewhere. Note that since the wage level at B is well beyond what is required to meet the individual’s real needs, and even allows a considerable amount of amenities, the individual is hurt little by being denied BC. What would cause so high a demand curve as described above? An individual could have an extremely rare skill that is in high demand in society — such as a professional football player’s ability to score goals, or an inventor’s genius. This gives the individual the economic equivalent of a monopoly for that skill, allowing him to demand very high wages. Nations with even the most laissez faire economies recognize the need to regulate the monopoly power of firms for the public interest, but nowhere is this applied to individuals. An example of the high demand curve can be seen in American professional baseball. Before 1976, salaries of baseball players were held down by restrictive contracts that forced players to stay on the teams they joined. However, that year players won the right to “free agency,” or the right to join the team that bid the highest salary. While the public was amazed to see salaries quickly double or even quadruple, economists argued that the new salaries were more fair, and more accurately reflected the players’ revenue contributions to their teams (their marginal revenue product). (McConnel and Brue, p. 181) Today one third of baseball players earn over $1 million per year. While the economists’ arguments of fairness have some merit, and most would prefer that the difference between the old and new salaries go to the players rather than into the owner’s pocket, it cannot be demonstrated that the quality of the play of baseball has improved. In other words, the higher salaries have had no incentive effect. From society’s standpoint, the higher salaries had little justification. As a postscript to this example, it shows not only the monopolistic power of rare skills, but also that such high salaries are more likely to occur in highly monopolistic industries such as professional sports. Power…plays a prime role in determining compensation. As a man proceeds up the corporate hierarchy, his power increases. This power includes, inevitably, the power to influence his own compensation or that of the managerial category to which he belongs. This is a simple, not very controversial, and extremely important fact (Galbraith 1973, 254-255). There is no evidence and no reason to suppose that the supply of executive talent requires the stimulation of the present prices. The number of able and eager candidates is consistently large. Those who get the largest pay have the most pleasant jobs. They are also the people whose performance depends least on pay — those who most pride themselves on their moral commitment to their work. In contrast those who do the most unpleasant and soul-destroying jobs get the least pay. And these are the people for whom pay is most important for extracting effort (Galbraith, p. 256). The chiefs of our major corporations have grown in power with little accountability either to their stockholders or the public. Boards of directors have been ineffective as checks on the actions of executives, as they are usually composed of executives of other corporations, with similar mentalities. The high salaries are reflections of the power and greed of the executives, not their productivity. Reductions in middle management make higher salaries more affordable. Junk bonds have lessened constraints capital shortages formerly would have imposed on leaders. “Leapfrogging” — the desire to pay one’s own executives at levels that are above the average. But this inevitably pushes up the average. “Poaching” — recruiting executives from outside the company is more common rather than grooming them from within. Executives from the outside need to be attracted with higher salaries. But whatever the cause of the excessive salaries, they still demonstrate the central point being made here. They clearly exceed what is needed as incentive to achieve high performance, creating waste, or economic inefficiency, for society.